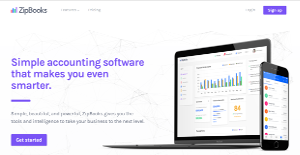 ZipBooks is a free accounting solution created to help freelancing professionals, contractors, small businesses, and growing enterprises handle their accounting and bookkeeping needs and allow them to get payments faster. The web-based accounting platform streamlines financial processes and significantly enhances productivity, resulting in faster payments. With a broad list of its financial partners, ZipBooks enables users to accept payments via credit cards and checks. The software provides tons of capabilities, including invoice creation, time and expense tracking, as well as future income projection. The software offers seamless integrations with other popular business systems and applications, including Asana, Google Apps, Google Drive, Google Chrome, and Slack. It allows you to create accounting reports, reconcile bank statements and connect to your bank accounts. The most obvious benefit that ZipBooks brings to the table is that it is a free accounting software. Users don’t have to pay for any subscription plan to use the service (small charges do apply, however, if you intend to use the services of their financial partners). Apart from being free, ZipBooks is a very intuitive accounting and bookkeeping platform that comes loaded with an extensive feature set. ZipBooks not only tracks your finances and allows you to create accounting reports, but also helps you see where your money is being spent. The platform offers bank reconciliation features where you can categorize your expenses and quickly view them in one account. Connecting your ZipBooks profile to your bank account is another huge benefit. This capability lets you synchronize all your bank accounts to help you keep all your financial data up to date. ZipBooks also enables you to pull up all your financial data and store them in a centralized location, making it quick and convenient for you to access all your financial information whenever you need to. The software lets you view all your total accounts receivable, paid invoices, average invoice age, and time tracked by team members in one view. With all information easily viewable, you will know what you need to do the moment you log in to your account. Enterprises have diverse needs and requirements and no software application can be just right in such a scenario. It is futile to try to find an ideal off-the-shelf software product that meets all your business needs. The wise thing to do would be to adapt the system for your special wants, worker skill levels, finances, and other aspects. For these reasons, do not rush and subscribe to well-publicized trendy systems. Though these may be widely used, they may not be the ideal fit for your specific wants. Do your homework, look into each short-listed system in detail, read a few ZipBooks reviews, contact the vendor for explanations, and finally select the product that presents what you want. How Much Does ZipBooks Cost? ZipBooks is available in 4 pricing packages. Among the choices is a completely free plan with no time limits while the rest are premium plans with more advanced features. You may also start with its 30-day free trial to check out its full functionality. We realize that when you make a decision to buy Accounting Software it’s important not only to see how experts evaluate it in their reviews, but also to find out if the real people and companies that buy it are actually satisfied with the product. That’s why we’ve created our behavior-based Customer Satisfaction Algorithm™ that gathers customer reviews, comments and ZipBooks reviews across a wide range of social media sites. The data is then presented in an easy to digest form showing how many people had positive and negative experience with ZipBooks. With that information at hand you should be equipped to make an informed buying decision that you won’t regret. My side gig burden is lifted with ZipBooks! We love how ZipBooks functions! Everything that I need is available in this freeware! What are ZipBooks pricing details? What integrations are available for ZipBooks? Pros: I like how I can easily sync numerous bank accounts and still be paid in a timely manner if the customer makes it late. In addition, ZipBooks is flat-out easy so expect very little learning curve. This makes it all the more convenient for me since I'm juggling a full time job with a business on the side. Cons: It's obvious: ZipBooks is still new in the market and their UI needs a bit polishing. But I have the confidence they'll push through in enhancing the software. For instance, their app intended for the iPhone was enhanced greatly since its launching. Pros: At present, there aren't a lot free options available when it comes to managing books for small businesses. This platform nicely fits without going overboard and spending money. Cons: It'd be nice to have the ability to export books or back them up automatically via a cloud. This would ensure my data is safe even if it would mean ZipBooks not making it in the company for the long term. This website is loaded with features and very light and fast. I have use Quickbooks Online and I find ZipBook is lightning fast in comparison. An accounting plattform that's robust and intuitive. I like how the interface is made and how it lets me make additions and alterations swiftly. Whenever an app delivers, it's a slam-dunk. That's been the case with me. I've never seen an easy-to-use platform that keeps my accounting streamlined! I simply love how ZioBooks make it so easy to invoice just about everyone. What's more, it does an incredible job managing things for you. It's been great for me overall. It's a simple and powerful product made for small businesses. ZipBooks is simply the best out there! If you need more information about ZipBooks or you simply have a question let us know what you need and we’ll forward your request directly to the vendor.